2 What Is a Fillet Knife? 3 How to choose a good fillet knife? As with other types of knives, choosing the right filleting knife can be a tough challenge. In this article, I will go through some of the details which make the fillet knives great. Also for those, who never used a filleting knife, there is and introductory section worth reading. At the end of the article, you will find my personal top list based primarily on fillet knife reviews by customers, my experience and research. If questions arise, please use the comment section below to ask me. The following table neatly presents the best rated models and also the best selling ones. Click the name of the knife to read more about it and see the customer reviews. A fillet knife is typically a kitchen knife that helps with filleting. With its very thin and flexible blade, it is much easier to fillet a fish or a piece of meat than with a traditional chef’s or boning knife. 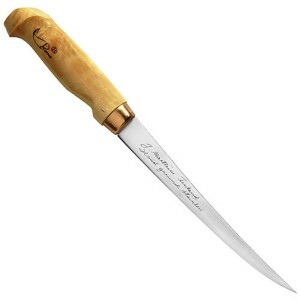 Therefore, if you love delicious dishes made of fish, you should think of adding a filleting to your knife selection. It will make your life easier. The blade is pretty much always made of stainless steel, measures between 5 to 11 inches, and is quite narrow. It also has a sharp tip and is usually not serrated, although a serrated blade may be useful for bigger fish. The blades cannot be made of ceramic because ceramic blades are not flexible, and flexibility is needed for filleting knives. The handle of the knife can be made of various materials. Most often, they are made of stainless steel, hardwood, or plastic. Hardwood is often not the best choice, because it can get slippery and there is a chance that it will absorb some of the fish odour. However that is usually not the case when it comes to a high quality filleting knife. Just be sure to read some fillet knife reviews should you decide to go the cheaper route. The flexibility of the blade is the main reason, why this knife is useful, because of it, it can reach places which would be very hard to reach with a rigid thick knife. Trying to fillet a fish with a chef’s knife could lead to utter destruction of the fish. Given the rising prices of fish, it’s probably not something you would want to do. Mind you, even the best filleting knife will not make filleting a breeze. It will still require a bit of experience. In case you lack the experience, try to watch a video or two to see how professional cooks fillet the fish. Apart from fish filleting, the filleting knife can be used for other meats as well. It will serve well for deboning or for chicken or beef filleting. Overall, it’s a good choice when you need to cut thin even slices. It can even be used as a substitute for a ham knife needed for slicing the delicious Spanish Jamon dried ham. In case of emergency, the santoku knife can be used for some filleting tasks as well. The maintenance of a filleting knife is pretty much the same as with any other knife. It’s always recommended to hand-wash the knife after use, dry it with clean cloth, and put it back to storage. Dishwasher can be harmful for stainless steel knives. How to choose a good fillet knife? There are several different factors that should be considered when choosing a the best fillet knife. I’v e compiled four most important factor which are relevant especially if you are going to use the knife to work on fish. Size – There is a big variation in blade lengths of the filleting knives. It’s important to choose such blade length that will fit your needs. Smaller fish will require shorter blades as it requires easier handling. Larger fish like salmon will require a 9-inch blade. Blade material – Stainless steel is the most common material for cheap and expensive filleting knives alike. However, not all stainless steels have the same quality. With a cheaper knife, you will most likely not find out what kind of steel was used to make it. Therefore, it’s wiser to go with a reputable brand even if that means spending a little bit extra. In the end will be worth it. Blade flexibility – Blade flexibility is most important for knives with shorter blades which are meant to be used for smaller fish. The longer the blade, the less important the blade flexibility becomes. However it still retain certain amount of flexibility even if it’s long. Handle – The knife can have the best blade in the world, however it will still be useless, if the handle slips out of your palm and you cut yourself. The handle should be comfortable and non-slippery. Plastic and rubber handles are becoming more popular than the traditional wooden handles, partly because of wood’s ability to slip when wet. Wood also has a bad reputation due to its ability to soak up fish smells. Do you love fishing? Do you sometimes catch so much fish that is chore to clean it? Then an electric version may be the tool of trade to save your day. Filleting a load of fish manually can be time consuming and boring. An electric filleting knife is deigned to make filleting faster and easier. An important thing to keep in mind is the fact that electric fillet knives are not primarily meant to be used in the kitchen. They are designed to be used by fishermen out in the field. I am not saying you cannot use such a knife in your house, it’s just not it’s primary use. Here is a selection of the best 5 filleting knives based on my criterias and customer reviews. The list will be kept updated, so come and visit the page later for newer recommendations. 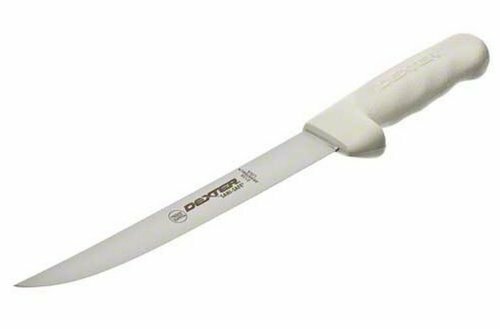 With a 7.1 inch long flexible blade, the Wusthof Classic filleting knife will provide great service for filleting, deboning and skinning tasks. The knife is made of high quality high-carbon steel, making it very durable and resistant to corrosion. The handle is made of synthetic materials, and it’s sporting a traditional type of design. The knife can be used either at home, or outdoors for hunting or fishing purposes. A nice addition is the sheath which will protect the blade. It is included free of charge. 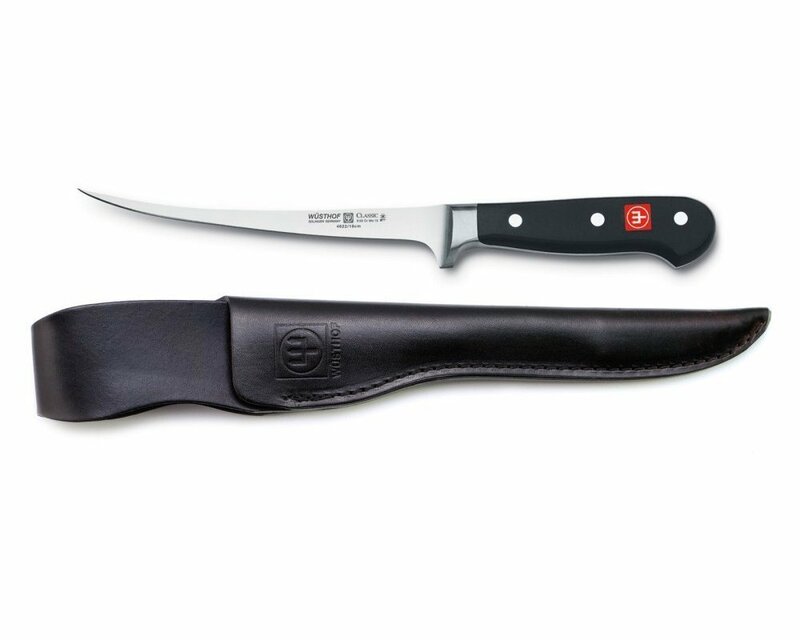 The Wusthof Classic filleting knife enjoys rave reviews from the customers. You can read my review of a similar Wusthof model – the Wusthof Gourmet 7-inch Fish Fillet knife. With a laser controlled blade, the JA Hanckels knife’s edge will last longer than your average fillet knife. The blade is made of high-carbon steel, which utilizes a patented system designed to offer maximum stain resistance. Similarly to the Wusthof knife, this knife sports a fully visible tang. This knife is often featured in JA Henckels knife sets. Its average customer’s rating makes this model one of the best filleting knives on the net. It is usually available for a slightly lower price than the Wusthof model. There is a lot of competition for the title of the best fillet knife under $50, and it can be quite difficult to choose the best one when you are on a tighter budget. However, I’ve finally chosen the Dexter-Russell model from the Sani-Safe series. The knife features an 8-inch long blade made of high-carbon steel. With a synthetic Grip-Text handle sealed around the blade, it will be relatively easy to keep the knife clean. The blade is slightly stiffer than standard fillet knives, so make sure you won’t buy it for purposes where a flexible blade is needed. With a low price and positive reviews, the Dexter-Russel model is definitely a good candidate for a new addition to your knife arsenal, if you are looking for a cheap knife. Buck Knives is reappearing in various top list over and over again when it comes to outdoor knives. This full tang filleting knife is made in the USA and is no exception in their line as it is among the top quality fillet knives available for reasonable price. It has a 9-inch fixed blade made of 12C27Mod Sandvik steel blade which gives the knife exceptional sharpness and edge retention. The blade is flexible enough and suitable for larger fish. The handle is made of rubber with numerous ridges which provide secure enough grip to prevent slippage. The knife is also equipped with a sheath with belt loop and drain holes. Just like other Buck Knives models, the 0028BLS1 is backed by the Buck Forever warranty. The knife enjoys very positive reviews by the customers. It may not look as good as some of the other Buck Knives products, but it’s well built and easy to use. Rapala is another company well know for making great inexpensive fish fillet knives. Although they started to focus on the electric fillet knife business, their traditional filleters are still great. This one features a full-tang Swedish stainless steel blade. With its length of 7 inches, it’s an ideal choice for many kinds of fish. While it’s primarily designed for freshwater fish, it can also be used for saltwater species, if wipe the blade thoroughly after use. The handle is made of traditional Rapala reinforced birch wood. It sits nicely in the hand and doesn’t slip off. A genuine leather sheath and a single stage sharpener are also provided as a bonus. With its low price and exceptional average customer rating, it would be a mistake to think that this knife is a bad choice. By all means go for it, if you seek a well-made cheap fillet knife.